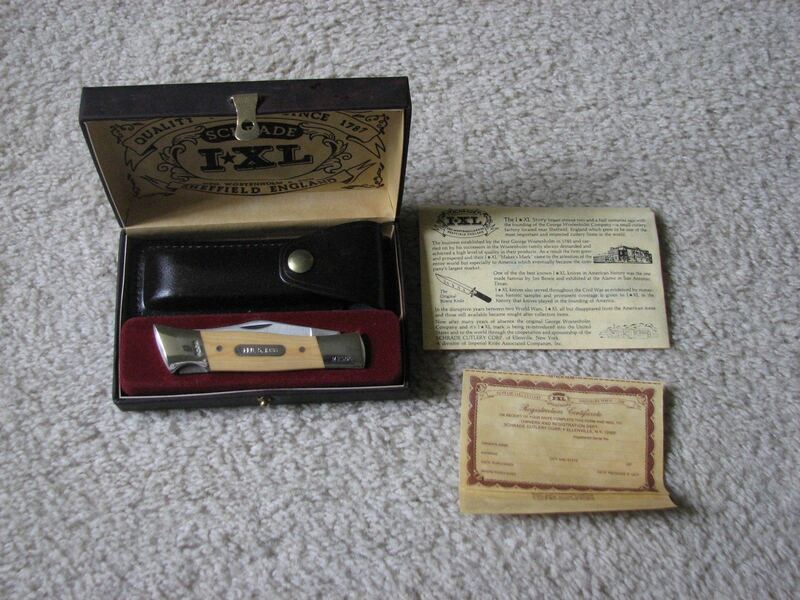 Schrade I*XL GS-30 with a Baer-y interesting story. Discussion in 'Schrade Knives Collectors Forum' started by bladecollectorr, Apr 1, 2018. On December 23rd, 1899, 28 year old Bertha Schiffer Baer was having labor pains and attended by her husband the 38 year old vinegar merchant, Max Baer. Early the next morning, December 24th, 1899, Henry Bodenheim Baer was born, eventually to known to the world as "Uncle Henry"
When Max married Bertha in 1899 the Baer and Schiffer clans were brought together. 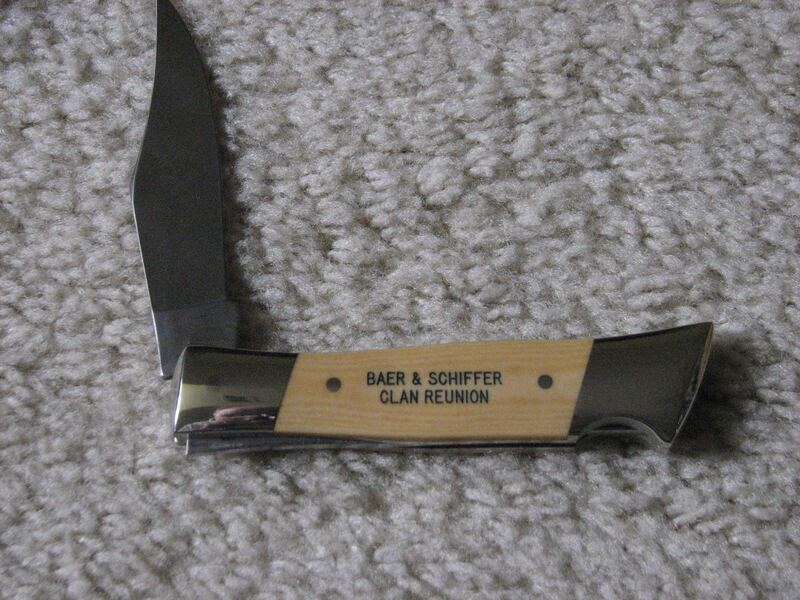 87 years later, in 1986, the Baer and Schiffer families had a well organized family reunion. How do I know? 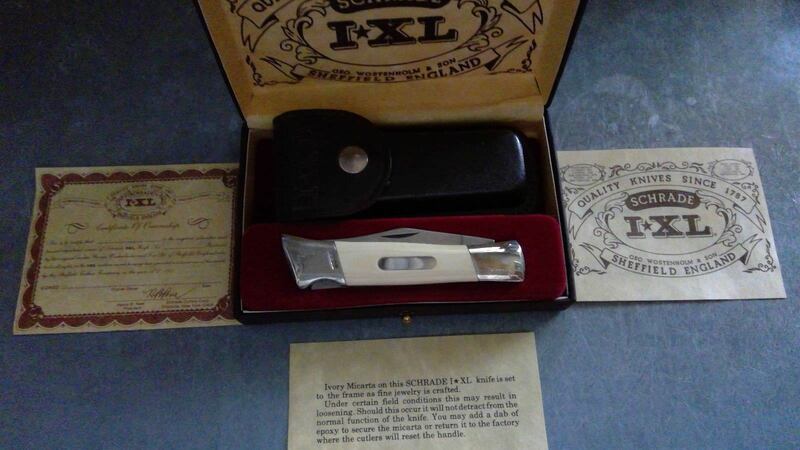 It seems Albert and/or Henry Baer gave out (at least) two different Schrade knives to commemorate the occasion. All these years later a gentleman who attended the reunion decided to sell these knives. "As for the reunion, yes, I was there along with my family. My mother was a Schiffer. The reunion was the only one that I know of. It was organized by a woman (I think it was Karla Baer) who had done a huge genealogy of the whole family and this was to allow us all to see the connections. I have no idea how many knives were given out. Quite frankly I couldn't give you any real information as to how many people were in attendance. Maybe 40-50 people, but it's only a guess. It was so long ago. We were focusing on our side and seeing all the houses that the Schiffers lived in and getting together with our closest cousins. I am sorry that I don't have the answers you were looking for. I will be packing up the knife today, it has been a busy week and my schedule has been wacky. Enjoy the knife, thanks for caring so much. (Reunion) was held in New York City where most of the ancestors had lived. It even had visits arranged so we could see the houses where they had lived. It was fun." That's the Baer story. I saved pics of both knives so I can show you both of them. The knife I didn't score was a big Schrade I*XL M-40 micarta knife. Here's the stag GS-30 I did land. koldgold, bucksforus and Codger_64 like this. Very interesting story and great knives; thanks for sharing! I have heard that the unpinned covers on some of the IXL collab's sometimes come loose. I have heard that the unpinned covers on some of the IXL collab's sometimes come loose. That's more than a rumour. Schrade was well aware of this and at some point started to include a "glue the handles back on if they fall off" advisory with such knives. I wouldn't buy any of the unpinned ones to use. Here's a pic showing the advisory. Note the unpinned knife is hallmarked 1980. The pinned one is 1981. I haven't checked enough examples to be sure but they may have pinned all of them starting in 1981.
koldgold and bucksforus like this. I had just read this thread not more than a a week or so before these two came up for auction. I was surprised at how little interest there was in them and more surprised when I won them both. Some interesting history to add to the collection. I had my eye on those two as well. I'm glad they went to another collector who appreciates the history. I think the engraving might be seen as post-sale "defacing" of these knives if you didn't know the name Baer and their part in the knife industry. Just a guess as to why they stayed affordable. If I see it correctly your GS-30 in the box is serial numbered as one from a "Master Set" whereas mine is not. It may mean nothing but perhaps there are commemorated examples of all 5 patterns out there. More Schrade to search for is always fun. You are probably right about the Baer name not being recognized by some potential buyers. I kept the one in the box....s# M2000, and sent the other one to Herman Williams who most certainly recognized the name. The lack of Schrade documentation and the occasional discovery of something new, or at least not commonly known, is absolutely a part of what keeps me a fan of Schrade knives. 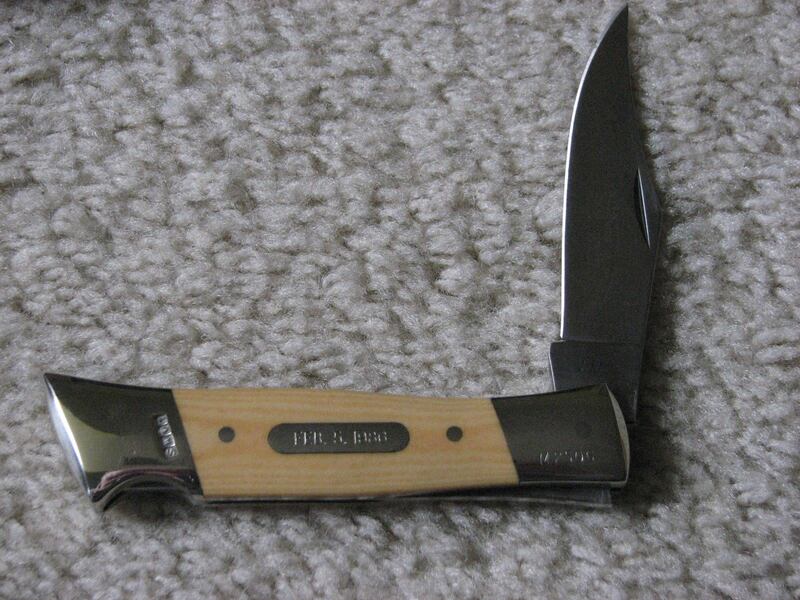 I stumbled across a 291 trapper some years back and recently found a second one. That was a good day.